The technology giant used iconic London theming to inspire delegates as its annual Cisco Live Europe event moved to the capital. Global technology firm Cisco holds five annual live events around the world - in the US, Europe, Australia, Middle East and Central America. 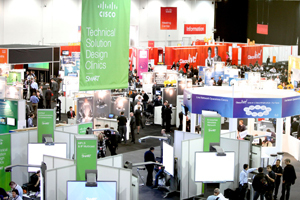 After three years of holding Cisco Live in Barcelona, the company struck a deal with the new ICC London Excel to host the event for the next two years. The new venue was announced during ICC London's official launch in June 2010, but planning had already been underway for several months for the event to be held from 31 January to 3 February 2011. Following an RFP process at the end of 2008, George P Johnson was re-appointed to produce Cisco Live 2011 for the eighth year running. Active Events was appointed to carry out delegate registration. More than 4,000 delegates had attended the event in 2010, and Cisco and George P Johnson had to be prepared for an uplift in numbers this year. "This is my most important event of the year," said Cisco chief executive John Chambers during his keynote speech on 1 February. He added it was a chance to "listen and share where we want to go". In addition to sharing Cisco's business vision with delegates who include customers and 1,000 of the company's staff, the event is a chance for networking, training and for technology providers to showcase new products in the World of Solutions exhibition area. 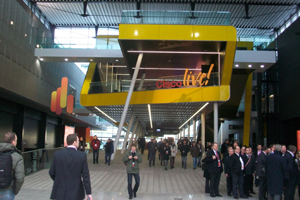 The event has previously been known as Networkers, and 2011 also marked the transition to using the brand Cisco Live for the first time at the meetings in London, Melbourne and Bahrain. Cisco's group manager for event marketing Europe Gerd De Bruycker explains: "We are expanding the target audience to go up the chain from system engineers to IT managers and developers." He adds that the main aims of the event are "technical training, thought leadership and networking". As well as the four-day event - which included keynote speeches from Chambers and oceanographer Dr Robert Ballard, more than 200 break-out sessions, and a "Meet the Engineer" programme - Cisco also planned an awards event for 150 people at The Langham, London, as well as a series of dinners hosted by its business leaders from across Europe. 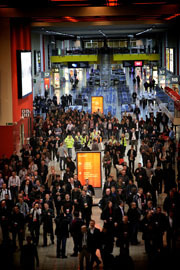 Cisco's project manager for Cisco Live James Bedford says one of the greatest challenges was that delegates were able to "literally turn up on site to register to attend". "We knew when we went on site we were hitting a large number of delegates and that continued to grow, as day passes were also available," he says. De Bruycker adds: "It is a trend in the industry that people register later and later and that brings specific challenges to all of us in the event-planning business. It makes it hard to plan." An increase of 40 per cent brought delegate numbers from 4,200 in 2010 to 5,800 this year, meaning the venue needed to be able to cope. Meanwhile, the combination of celebrating the 20th anniversary of the Cisco Live Europe event and its first outing in London meant there needed to be an atmosphere of excitement to the conference. 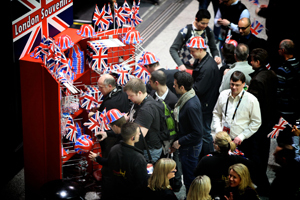 Cisco also wanted delegates to experience a real sense of being in the UK's capital while at the event, so needed to come up with ideas that would create a tangible theme throughout Cisco Live. George P Johnson's director of client services Lesley Mason says planning had to begin in 2009 so that details of the event could be announced in 2010. "We needed to look not just at the requirements for the plenary and keynote sessions, but also the breakouts and technical content," explains Mason. "We needed to choose a venue with the capacity and the flexibility and the ICC London Excel was picked in November 2009. We were actually looking at altering room sizes even in the final run-up to the event to make sure everyone had a fair chance at getting in the sessions." A team of five from Cisco worked full-time on the event, along with a core of five from George P Johnson, rising to 13 as the date got closer. Support staff supplemented the in-house and agency event teams. As a technology company, Cisco needed to engage with delegates through elements such as social media. The team used its Social Miner tool to listen to tweets and then follow up face to face with delegates during the show. In addition, in the plenary hall, large screens showed a rolling Twitter update from delegates tweeting using the hashtag #CLEUR. To bring the London theme to life, traditional red phone boxes were placed throughout the ICC's main thoroughfare, while a town crier paraded the corridors directing delegates into the latest sessions. Images of iconic London scenes were projected onto giant screens in the main auditorium before the keynote speech, while the cast of the West End show Oliver performed a musical opening, accompanied by Cisco's vice president of technology and corporate marketing Amanda Jobbins. De Bruycker explains: "We really wanted to see the event was happening in London." A Covent Garden-style experience was created during the evening networking sessions using local buskers. Meanwhile, the link with the forthcoming Olympics was emphasised with a live Q&A session between Jobbins and Olympic medallist Roger Black. "Overall satisfaction of the event was higher than the last couple of years and that was a real highlight," says De Bruycker. "Compared to last year, our on-site sales for exhibitors for World of Solutions more than doubled. We also had a great customer appreciation event. Even within Cisco, our colleagues were so excited." He adds that despite a long-standing relationship with George P Johnson, Cisco "always expects the agency to exceed what we set them". "All the pieces of the jigsaw fitted together and it was a great event," concludes De Bruycker. Cisco took a "two-pronged approach" by asking for feedback on all the content sessions, as well as asking delegates to complete an end-of-conference survey. Cisco received more than 11,000 responses to the content-based sessions, and is now compiling the responses from the overall conference surveys. "We ask them about the overall content, the Meet the Engineer sessions and things like on-site check in," adds De Bruycker. "We measure all these elements to give us an idea of where we need to improve." George P Johnson's team also carried out interviews with delegates during the event to supplement quantitative data with qualitative evidence. 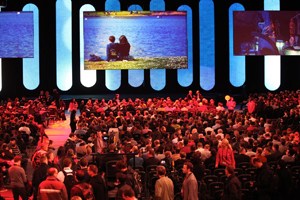 31 Jan-3 Feb 2011: Cisco Live takes place.